Successfully Added 6.5 Inch Region Free Car DVD Player with Bluetooth (2-DIN) to your Shopping Cart. An all-in-one touchscreen entertainment solution for your vehicle in a convenient 2-DIN (100mm tall) size. This widescreen multimedia wonder is sure to provide maximum enjoyment for you and your passengers. We can't think of a better way to turn your car or SUV into a mobile movie theatre than with this full-featured 6.5 Inch touchscreen LCD car dvd player. In picture perfect clarity and optimal viewability, it effortlessly plays all the popular disk formats like CD, MP3, VCD, and full-length DVD's too. Did we mention it's a region free car DVD player? The benefit to you is that no matter where the DVDs were created or bought, you'll be able to play them on this versatile multimedia station. If that weren't enough, simply load some MP4s or AVI videos on a SD/MMC card or USB thumb drive and let the built in media player take care of your entertainment needs for hours and hours. All you have to decide is what to watch? Up for watching Gone in 60 Seconds or be Fast and Furious 3? Touch the screen and let the fun begin! Wait there's more. Check with your provider though, but it's entirely possible that this awesome double-DIN car audio video center may actually help you save money on insurance as it contributes to a safer driving environment by allowing you to talk on your mobile phone handsfree with its built-in Bluetooth functionality. 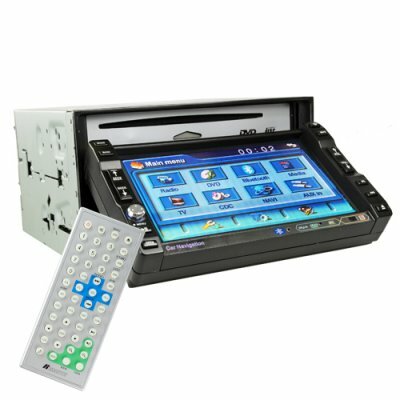 Easily pair your cell phone with this vehicle entertainment unit and talk to your caller through the built-in MIC and listen to them through your car speakers. This is a winning feature for anyone with family, friends, or more importantly mobile office workers that need to constantly be in contact with co-workers and customers. Don't delay, hit the "Add to Cart" button and pick one up for yourself or give it to someone you care about. They'll love this gift. What's more, sell it on your online store. It's great for customers who want a car enhancement system without being overwhelmed by tons of features they'll never use. Brought to you by the online leader in direct from China wholesale electronics - Chinavasion. Great product, I only started selling this DVD player a couple months ago on ebay and there has been very strong demand for it. Fantastic delivery time and service keep up the good work.